A Limited Edition Ornament. The hospitable reputation of George and Martha Washington encouraged hundreds of guests to trudge through ice and snow each year in their admiration of the "Father of His Country." This 22-karat gold-plated brass finished ornament looks like a framed painting. 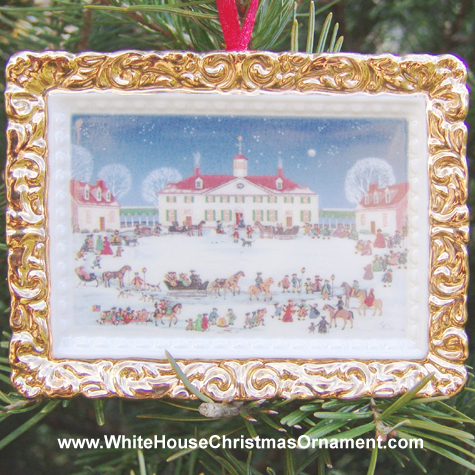 Each ornament, adapted from a painting of the West Front of Mount Vernon by modern folk artist Carol Dyer, is numbered as part of a limited Year 2000 edition of 10,000 ornaments.